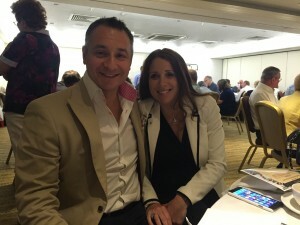 It’s National Blood Week and Vicki & I were invited to attend a ‘Recognition Ceremony’ held by NHSBT (National Health Service Blood & Transplant) in a Central London hotel yesterday. This was an ‘afternoon tea’ event to recognise blood donors who had given over 100 red cell donations and also platelet donors who had given more than 250 platelet donations. 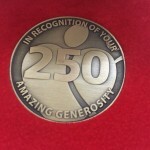 It’s remarkable – these are people who have regularly and consistently been donating blood for 20 years or more. And one gentleman I met first gave blood in 1963 ! 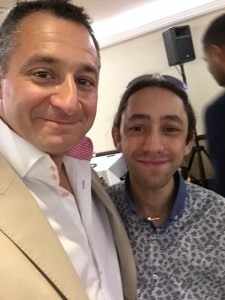 I was one of two people invited to speak; the other was Simon Cooper, a cystic fibrosis patient who is a double lung recipient as well as a liver recipient. Simon & I were both also asked to hand out the awards to the blood donors. Vicki & I very much regarded the people in the room as ‘Margot’s blood donors’, so we were pleased to have the opportunity to express our gratitude to those assembled. It was an incredibly emotional affair. Pasted below is a copy of my speech (which is to be read in conjunction with the numbered photos). Thank you to all the anonymous blood donors out there and please keep up the good work ! p.s. 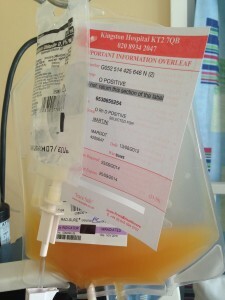 visit: blood.co.uk and give blood. 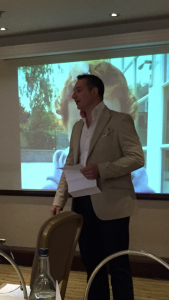 It’s a very great privilege and honour to have been asked to speak today. We haven’t met before, but given you’re at this event, I know you all to be very special people. And by addressing you here, I feel as though I have been given an opportunity to try and at least go some way towards expressing my gratitude, and my wife Vicki’s gratitude & thanks to the wonderful people who stepped up and provided for us, when we were in our time of need. I stand here speaking on behalf of all our family and loved ones. And I suspect that I’m also speaking for all the patients out there who receive blood, and their families too – because, of course, the patient and the patient’s family don’t ever get to meet their benevolent & selfless blood and platelet donors. So this is as close as we’re going to get to saying thank you. And because you don’t get to meet the patients to whom you donate blood, I hope you might find something in my daughter’s story that helps you relate to some of the desperate circumstances and situations that people find themselves in, when they need blood / blood products, as the doctors refer to your donations. So what I’m going to do for the next few minutes is give you a brief glimpse into Margot’s story. 1 This is a photograph of Margot. 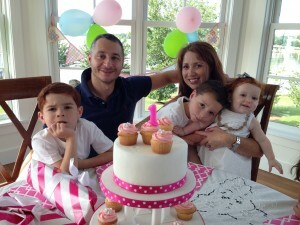 2 And this photograph was taken on her first birthday – that’s Vicki there next to me and our boys, Oscar & Rufus. Sadly, I have to tell you ladies & gentlemen: Margot died in October. She was aged two years and two months when she passed away – but the reason why, in our case, we feel so unspeakably grateful to you, is that you helped give us the precious gift of time with our daughter and the gift of hope. Time and hope that we would never have enjoyed, were it not for your donations. And during that time, Margot grew, she developed and she blossomed from an infant to a toddler and for 12 months longer than she might otherwise have, were it not for you. 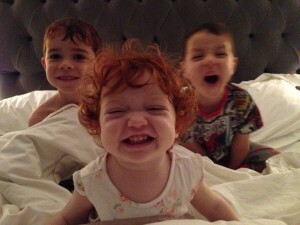 4 Margot was a cheeky monkey. Let me take you back – in this photograph she was just 14 months old; this was taken in early October 2013, just a few days before she was diagnosed with blood cancer. It might sound silly to say it, but at the time, we really didn’t know that Margot was THAT unwell. Margot had always been pale skinned but we had sensed for a while that something wasn’t quite right. Vicki had grown increasingly concerned about the bruises showing on Margot’s body (mainly on her legs). Shortly before her diagnosis, we were being told that Margot had a viral induced wheeze and she had even been kept overnight at our local hospital before being discharged to come home. In retrospect, the astonishing thing for us is that having flagged these concerns with several doctors, not one of them detected what the problem was, or even suggested a blood test. For the avoidance of doubt, we don’t blame anyone – that’s not how we feel. 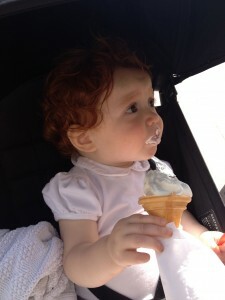 Margot was red headed & fair skinned and at that age when youngsters start to move around a lot – so red hair, pale skin & bruises on a toddler provided a cover under which the leukaemia was lurking. 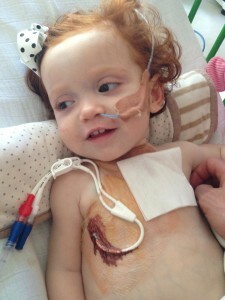 So, we only discovered that Margot had leukaemia when the disease was at an advanced stage. 5 This photo was taken on Monday 7 October 2013 – on that day Margot woke at 5:30am and vomited. We decided to take her to a private paediatrician and he straightaway suggested that she be admitted to hospital, following a physical examination. That paediatrician sent Vicki home with instructions to prepare for a hospital stay, suspecting Wilms disease, which is a tumour on the kidneys (Margot’s abdomen was distended at the time). I took this photo at home whilst Vicki was busy packing a bag. 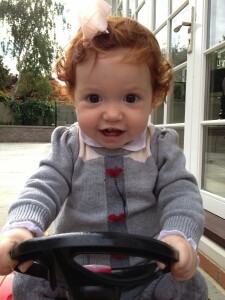 With the benefit of hindsight, when I look at it now, I can see that Margot doesn’t look well. At Chelsea & Westminster Hospital, the ultrasound scan showed that there was no massing and that Margot’s kidneys were all clear – cue huge relief for us both; thank goodness ! For a moment there, we thought Margot might have had cancer. Maybe she’s just anaemic ? But then the blood tests came back. There was initially some confusion. The full blood count didn’t make sense. The numbers were very abnormal. 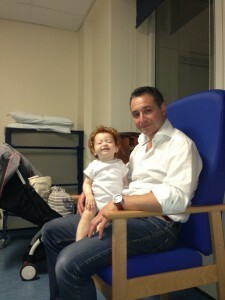 So they assumed that Margot’s bloods had been contaminated somehow and they took more blood for further tests. Those full blood count results came back again, with very abnormal numbers. 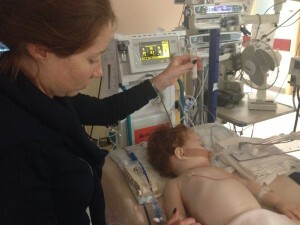 It was noted that the number of white blood cells was extremely high (Margot’s white cell count was recorded at 420. It’s normally within the range of 4 – 10 or perhaps 12). We were told us that most likely, this was leukaemia. The doctors didn’t seem certain – it was all very early information – but that was the direction of travel. 6 Vicki took this photo moments after we were told that Margot had leukaemia. I didn’t know what leukaemia was – all I knew at the time was that it was life threatening and I was afraid that Margot was going to die. 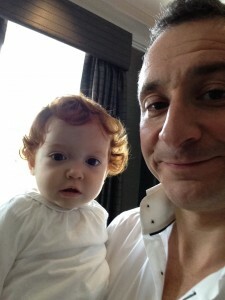 I wasn’t in a good place, but as you can probably see, Margot was gurning at the camera. She was still functioning normally. At this stage, we were alone in a room and all was pretty quiet and calm. 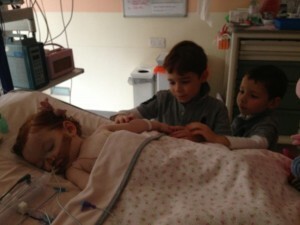 Chelsea & Westminster Hospital explained that they weren’t going to begin treating Margot because she was likely to be transferred to Great Ormond Street Hospital (GOSH), probably in the morning, but maybe that night. 7 We eventually ended up being transferred to GOSH later that night and arrived there in the early hours of the following morning. 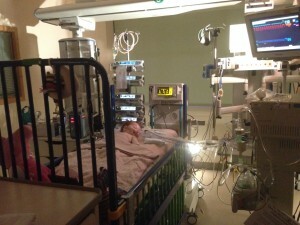 Until we actually arrived, I hadn’t appreciated that we were going straight into the paediatric intensive care unit. It was instantly clear on arrival that there was something very seriously wrong. This was an emergency. 8 We were all exhausted, Margot especially. Around us, were many doctors and nurses – it was a real commotion. There was so much going on. More examinations & tests ensued and Margot’s diagnosis was again confirmed. 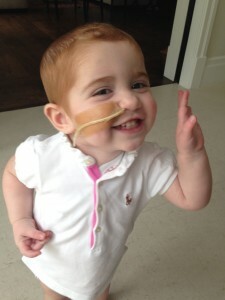 This time, they told us more specifically that Margot had Acute Myeloid Leukaemia (AML). 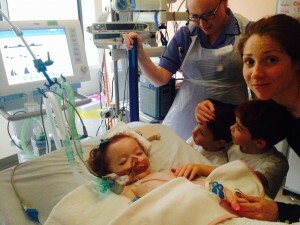 It was a bewildering time and yet we understood that we had no choice but to let go, as parents, and surrender Margot to the medical team at GOSH. There was nothing more that we could do. Vicki was up and down. There was a time when she started to visibly shake. Pure frustration and anger. 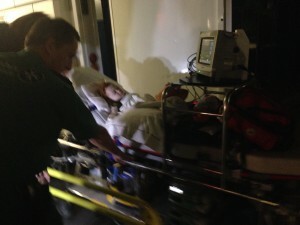 She had to leave the intensive care ward & get out of the way. She found a private room where she shouted and screamed out loud; but she knew that Margot needed her calm and from thereon she always coped extremely well in times of adversity and was the stronger of the two of us. My feelings were also unpredictable. The initial shock and surreal feeling gave way to a different phase of emotion. I felt completely & totally helpless. I was prone to uncontrollable bouts of tears. Sobbing. I struggled seeing Margot in distress. It was extremely upsetting. 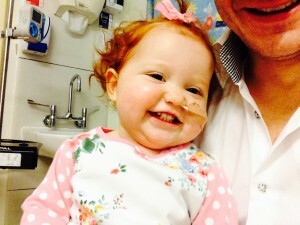 Margot’s platelet count was 16 (it’s normally 150-400) – it was so low there was a risk that she might not form a clot, so there was an urgent initial need for Margot to have a platelet transfusion. 9 That’s when you first stepped in. A request was made for platelets and then they were duly received and administered. That was step one: stabilise Margot’s clotting capability. Thereafter, because her blood was so awful, an exchange transfusion was proposed – that’s when they flush new blood through the patient’s body and entirely replace the patient’s existing blood with someone else’s. So red cells were requested and duly provided. 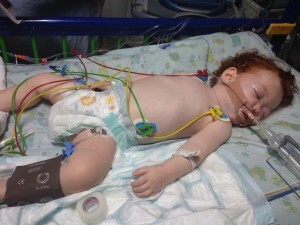 10 The exchange transfusion requires a general anaesthetic – so Margot was heavily sedated and medically paralysed. The proposal was to keep her under general anaesthetic for several hours, until the transfusion was done. 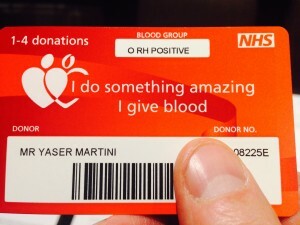 As I say, I was in a state of shock but also amazed: someone had donated blood for moments like this ! At the time, I asked the nurse whether they had the bloods that were needed in stock & she confirmed that they did, but that this wasn’t always the case. I felt fortunate & I felt grateful. And then I felt ashamed. I hadn’t ever given blood. 11 In intensive care, the pace and weight of information is rapid and relentless. It was difficult to stay on top of what was going on – no sooner was something understood, then the goal posts moved again. All I really knew was that our world had just been turned upside down and yet, Margot still had a chance. 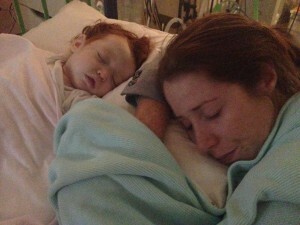 We still had hope, because that morning, you saved our daughter’s life. 12 In the event, Margot remained in an induced coma. 13 It was touch and go. The only thing I can tell you is that without the platelet and red cell donations that day, Margot wouldn’t have stood a chance. You gave her that second chance at life. 15 Margot managed to survive that episode and was safely brought out of her coma just over a week later. 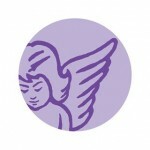 From there – she made a slow recovery, at least towards what became a “new normal” state of health. 16 It turned out that Margots leukaemia was extremely rare – she had both Acute Lymphoblastic Leukaemia (ALL) as well as AML which meant that there was very little data on her condition; the haematology consultants told us that they had only seen three people with dual lineage leukaemia in ten years. Consequently, they didn’t believe that chemotherapy alone would rid Margot of the disease and from the start, they advocated that Margot would stand the best chance of survival if she had a bone marrow transplant, also known as a stem cell transplant. The plan was for us to try and retain control over the disease using chemotherapy for long enough for Margot to have her Bone Marrow Transplant. 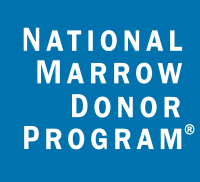 And to have a bone marrow transplant, first you need a matching donor – someone with the same tissue type as you. So there’s a register of potential donors that exists. However, the search process was complicated by the fact that Margot was mixed race. Basically, if you’re Northern European & white then you have about a 50% chance of finding your perfect match. You have a half chance. If you’re from an ethnic minority or if you’re mixed race then your chances of success in finding a match fall to just 20%. Ultimately, it’s a numbers game – and globally, we need more people on the worldwide stem cell registers. So we launched a campaign to help find Margot her perfect match, asking the general public to do something amazing and register as a potential stem cell donor. You might save a life, we said, and it could be our daughter’s. 17 All the while we were waiting for news of a donor match, Margot regularly needed both platelets and red cell donations to keep her going. I can’t tell you how many times she needed your blood products, but it was a lot. 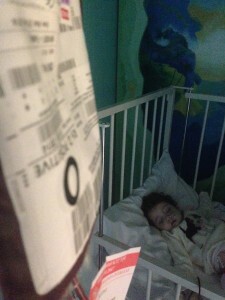 And again, post transplant the need & importance for more blood products remained, in order to keep Margot clinically well. 18 Initially, we understood that Margot’s BMT had succeeded, but in June last year we learned that the ALL clone had returned and worse still, the following month, the AML clone returned as well, at which point Margot was declared incurable. 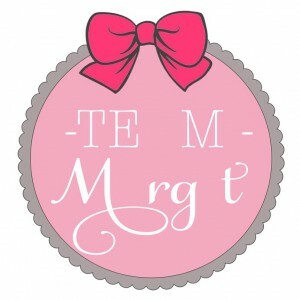 19 Team Margot continues to campaign for more people to join the worldwide stem cell registries. And for the reasons I have told you about, we also encourage people to give blood too. 20 In the next few weeks Team Margot will be holding the first joint donor recruitment event at GOSH working with NHSBT to encourage the hospital employees there to register as blood, stem cell and organ donors and we hope that this will develop into a series of ongoing events, not just at GOSH, but elsewhere, in other hospitals as well. And as part of our work, we are seeking to improve the awareness amongst existing blood donors that you can register as a potential stem cell donor by simply giving an extra blood sample of 5ml or so, the next time you donate blood. I understand that currently, only 15% of all existing blood donors are also on the stem cell register. 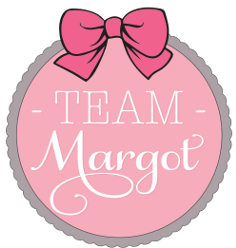 I’m just about done, and when I stop talking, we’re going to play you a short video – it’s our Team Margot appeal video, which is an adapted version of Margot’s original YouTube video that has been seen over 115,000 times. Thank you all so much for listening, thank you so much again for doing what you do and very many congratulations on your achievements.